x42 is a decentralized cryptocurrency based on the Stratis technology designed to be a multi-chain solution for DApps (decentralized applications) ranging from small indie-developed games to large entrepreneurial projects. The x42 vision is to be a scalable, on-chain solution for any developer that wants to launch games and applications in general with minimal initial investment, zero transaction fees and near infinite scalability. Side blockchains can be created at will by the developers that decide to use the x42 protocol to launch their projects, side blockchains are very flexible and allow for a great deal of customization. 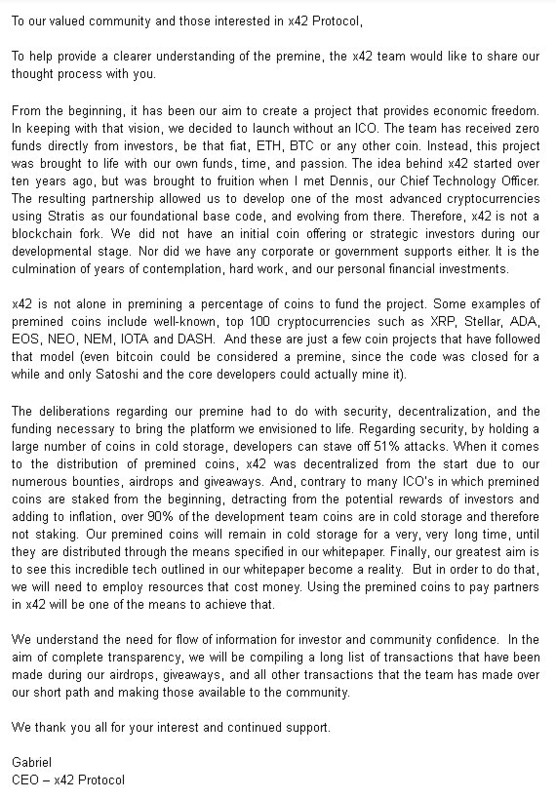 The team released a letter regarding the Pre-Mine which can be found here. The x42 blockchain platform offers every tool necessary for the development of smart contracts, side blockchains and the means to decentralize the final product in very few steps. Not only will you be able to create, test and debug your product on the same platform, but it will also for the publishing and decentralized hosting of that same project. I sat down with Myke B who is the CXO (Chief x42 Officer) of x42 Protocol to discuss the project further. You mention on your site that the team are veterans in Crypto. How long have you all been in Crypto and what was it that attracted you to the space? Well, the team has all been a part of the space for quite a while and worked on projects prior to x42. I was first introduced with the concepts and using proof of work, mining for profit before Bitcoin came about. What is your background and what was the driving force behind starting your own project? I have a very diverse background that spans multiple industries and disciplines. At an early age I was introduced computer components. I toyed with early wireless “internet” style connectivity, positioning and location technology, nodes and modems. By high school I was launching websites, self learning how to code and create them. X42 is not my project however, it’s bigger than any one person. On your website you touch on the fact that you launch your blockchain on the anniversary of the Slavery Abolition Act. It’s clear that freedom is a key principle of yours. Could you give some insight into how you think blockchain technology can progress an individuals privacy and freedom? Blockchain is a tool for freedom that provides options to the individual. It takes away the risks of a central authorities control, or lack of, over your information. You have the choice of privacy or transparency. The freedom of choice is undeniably yours. 2018 was a tough year for the Crypto market. However, from a tech perspective, we witnessed even more innovation and advancements than ever before. Although the project was created in August, can you talk about the progress you made last year? It was an exciting year for x42, from initial launch, improvements to the Full Node and addition of multiple exchange listings. What was your finest achievement in that time? Integration of the Telegoater and DiscoGoat. The two work seamlessly to bring the discussion on discord to the telegram users and vice versa. So the community is part of the experience regardless of your social platform preference. Both are bots. They are tools to keep the social platforms Telegram (Telegoater) and Discord (DiscoGoat) connected. No matter which platform you prefer, you are still part of the same conversation. The community can enjoy nearly seamless and instant conversation just like the x42 transactions. In the short time you’ve been a company you’ve already managed to build up an impressively strong core following – how do you keep your community so engaged and satisfied? The community is the most important part of any project. The x42 team is always responsive to their questions and feedback. If you need help, we are there anytime of day to answer. We spend a lot of time engaged with them in conversation. We are just as thrilled as they are when that 1st stake arrives. We work to train the team to provide the most useful information for problem resolution. The community are the ones that make this possible. We are here to deliver the tools. A key component of your Q1 success will rely on your tiered Masternode system. Can you please give a little detail as to how this works and why you decided on tiers? Tiers just make more sense. They provide different degrees of entry and various different features. In Q1 we will finalize the Tier 1 Masternode release. Not only will it validate transactions but also host and profit from dApps, provide staking rewards and feeless transactions. The Tier 1 Masternode does not require a significant amount of collateral making it affordable and available to those that aspire to host one. The other tiers add more features to the platform and expand the capability of the network. Making x42 one of the most scalable and enriched decentralized hosting platforms for developers. Can you talk a little about what we can expect from your next stages of development? The primary focus at the moment is providing a stable and solid Tier 1 Masternode. It is not like the ones most are currently using. It is something new. It must work not only for the host, but also for the developers in a way that is simple and robust. What can we expect from x42 in 2019? Are there are many surprises around the corner? 2019 will be a big year for x42. Not only will Masternodes go online but so will the decentralized applications. There are also a number of other surprises being developed that I can’t discuss at the moment. But they will make x42 even more accessible and sustainable. Stay tuned. What are your views on Crypto as a whole for 2019? I believe we will see the continued withdrawal of retail investors from the market for the moment. New regulations will be added. Old regulations changed. Innovation will continue to be developed across many projects. More education across the investors will allow for better informed decisions. Adoption will be existent, slow and careful. But the cryptosphere will expand, innovate, evolve and move towards it’s next phase. Can you summarise your ultimate vision for x42? The development of the x42 protocol will raise the bar for what cryptocurrency can do and what users can expect. *If you would like to donate some x42 to help fund the site you can do so below. These proceeds will be used to ensure that content remains free and costs such as web hosting are covered.